Intended for military, law enforcement, tactical and search & rescue personnel who appreciate the importance of having the right gloves for the mission at hand. The M-Pact® 2 absorbs punishment with a flexible knuckle, whilst moulded rubber finger guards create a barrier between the hands and everything else. The M-Pact 2 creates easy trigger access and weapon handling, while the index finger remains unobstructed for maximum dexterity. Finally high wear areas of the palm padded and reinforced for durable comfort in the field whilst a moulded Neoprene cuff provides a seamless fit. Machine washable. Size: S, M, L and XL. 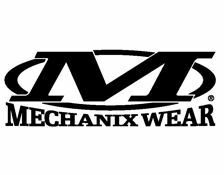 For Mechanix sizing info - click the Mechanix logo below. Colour: black.